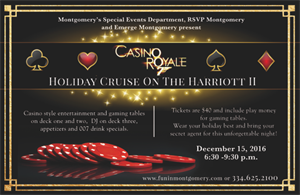 Come aboard the Harriott II for Montgomery's first Casino Royale Cruise. Your cruise ticket will include $1,000.00 worth of play money to be used in real casino style gaming: Black Jack, Texas Hold 'Em, Craps and Roulette. At the end of the night you can trade in your chips for a chance to win some awesome prizes. This cruise is two hours long with a post 30 minute dockside, Live DJ Entertainment, Appetizers and a Full Cash Bar. Must be 21 and over. Don't Miss the Boat!